Tonkawa Tribe of Oklahoma is a federally recognized tribe of Oklahoma with over 700 enrolled tribal members. The Tonkawan tribal reserve is located in Kay County Oklahoma and is headquartered on the west bank of the Chikiaskia River just southeast of the town of Tonkawa. The Tonkawa was once composed of a number of smaller subset of tribes that lived in a region that extended west from south central Texas and western Oklahoma to eastern New Mexico. The Tonkawa had a distinct language, and their name, as that of the leading tribe, was applied to their linguistic family. They were one of the most warlike tribes during roughly two centuries of conflict with their enemy tribes, the Spanish and, later, American settlers. Their men were famous warriors, and their chiefs bore many scars of battle. The Tonkawa women were also strong physically and vindictive in disposition. The Tonkawa were nomadic in their habits, moving their tipi villages according to the wishes of the chiefs of the different bands. They planted a few crops, but were mostly known as great hunters, using bows and arrows and spears for weapons, as well as some firearms secured from early Spanish traders. They became skilled riders and owned many good horses in the 18th century. From about 1800, the Tonkawa were allied with the Lipan Apache and were friendly to the Texans and other southern divisions. By 1837, they had for the most part drifted toward the southwestern frontier of Texas and were among the tribes identified in Mexican territory. The Tonkawa were removed from Fort Griffin, Texas in October 1884 and transported by railroad to a temporary stop at the Sac-Fox Agency near Stroud, Oklahoma. The entire Tribe wintered at the Sac-Fox Agency until spring, then traveled the last 100 miles by wagon in severe spring storms. They reached the Ponca Agency on June 29th, and then finally “Oakland” on June 30th, 1885. This was the Tonkawa “Trail of Tears”. A time in their history that they will never forget. The Tonkawa has changed the date of its annual Pow-Wow to coincide with this historic date, during the last weekend in June. 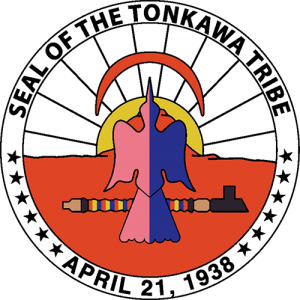 Today the Tonkawa tribe is a successful self-sustaining nation. It operates a number of businesses which have an incredible economic impact on the members it serves. Along with several smoke shops, the tribe runs the Tonkawa Indian Casino located in Tonkawa, Oklahoma, and the Native Lights Casino in Newkirk, Oklahoma. Today the Tonkawa tribe is a successful self-sustaining nation with over 700 enrolled tribal members. It operates a number of businesses which have an incredible economic impact on the members it serves. Along with several smoke shops, the tribe runs the Tonkawa Indian Casino located in Tonkawa, Oklahoma, and the Native Lights Casino in Newkirk, Oklahoma. The annual Tonkawa Powwow is held annually on the last weekend in June to commemorate the end of the tribe’s own Trail of Tears when the tribe was forcefully removed and relocated from its traditional lands to present-day Oklahoma.